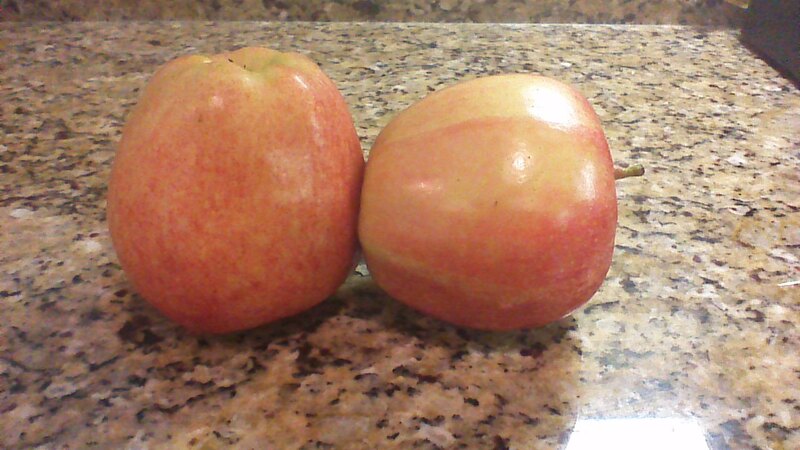 3 small apples, peeled cored and sliced thinly. Cook the sliced apples with the first 4 ingredients in a small amount of butter (1 tbl should do), until the apples are fork tender-place them in a bread loaf pan that has been sprayed with cooking spray. In a separate bowl, place the ½ box of spice cake mix (NOTE: save the other half for cookies, a streusel topping or another cobbler! !- place it in the freezer in a plastic bag to keep fresh longer). Add to the cake mix, the melted butter, almond milk (or whatever liquid you choose to use), sour cream. Mix just until incorporated. Pour over the cooked apples in the bread loaf pan, sprinkle with pecans cover with foil, put on your grill while your meat is finishing up- it took approximately 15-20 minutes to cook ours, but the time will vary, so please don’t “leave it and forget it”. It will be done when the cobbler is firm. I served with a bit of heavy cream, but it would be good with lightly whipped cream or ice cream too! A can of pie filling to replace the fresh apples, no need to cook or heat them first. Lemon cake mix with blueberries or strawberries. Orange cake with strawberries or mangoes. You could even add chocolate chips to the Cherry pie filling cobbler or fresh strawberries! A drizzle of chocolate ganache on top of the cherry or strawberry cobbler would be awesome too! A NOTE: about your grill, you make need to put a cookie cooling rack UNDER the baking pan to keep the bottom from scorching or burning. My hubster turned off several of the burners on our grill when the meat was done to keep the temperature a little lower, he also moved the pan off direct heat. It was yummy, used Basil from my back yard for fresh pesto. I also added a touch of honey to mine. Put all of this in a food processor and make a paste add olive as needed. I used a greek olive oil that had a really grassy flavor. Use your favorite olive oil. Pesto can also be made out of cilantro or a mixture of basil, oregano, spinach, parsley, just let your imagination go wild and experiment with herb and greens. You can also experiment with different olive oils from different countries which will give the pesto a different flavor. Every terroir give the olives a different bouquet and flavor. So experiment, have fun!!! 1 cup pre-made spaghetti sauce, you a good quality one-I like Bertolli, but you can use your brand. NO RAGU though. Cook for about 15 minutes on low to reduce just a bit. Cut 4- 4-6 oz chicken breasts into stripes and marinate them in about ½ cup pesto for 30 minutes. Sauté marinated chicken strips in a hot skillet until cooked through but don’t overcook. Remove from skillet and add chicken andouille (4 sausages), that you have sliced on the bias , sauté just until heated through. Use your favorite pasta cooked according to the package, add the cooked meats, sauce with Cajun Blush Sauce and serve!